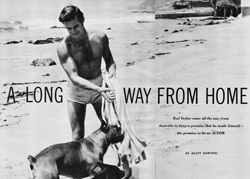 An article in Photoplay magazine, March 1957, featured a photo of Rod Taylor on the beach in Malibu (see below). I recently acquired a contact sheet with outtakes from the photo shoot, with more pictures of Rod romping with dogs, leaping over rocks and lugging a surfboard. For your viewing enjoyment, use the links below or visit the Body Beautiful page. Check out the new page featuring awards that Rod earned throughout his career. 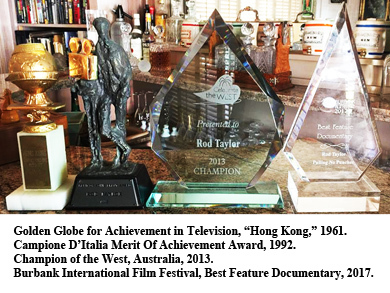 From Sydney radio in 1954 to a Golden Globe for "Hong Hong" to being part of the best ensemble cast in his final movie role, Rod has racked up some eclectic honors. 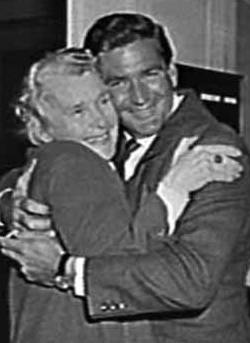 Wishing a happy birthday today to an unsung hero in Rod Taylor history: Elizabeth Ploger! When Liz was a secretary at MGM in the 1960s, she was asked to help produce the fan club newsletter for Rod Taylor. She jumped at the chance! 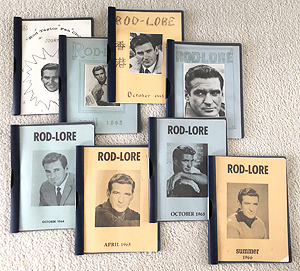 Because of the efforts of Liz and a team of fans across the country, the Rod-Lore newsletter was chock full of information about Rod, his films and his family. She often recruited the help of special correspondents, notably Rod's mother and his assistant, Marco Lopez, who reported about "The Glass Bottom Boat" on Catalina Island. The semi-annual newsletter included a letter from Rod, an update from Liz, a Q&A with Rod, and then reviews and reports about the movies he was making or had just been released. Information from from Rod-Lore is scattered throughout this site, but one of the best examples of Liz's work is her report in the October 1964 issue, "On location with 36 Hours" (PDF). Liz turns 85 today, and here are photos of her at Rod's home in 1964 and at the screening of "Rod Taylor: Pulling No Punches" in 2017. Happy birthday, Liz! Today is Rod's birthday! His career was a gift to us all. 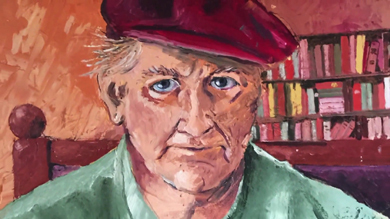 Today's update is an expanded page about his artwork, complete with a gallery of Rod's painting, pottery and furniture-making. Enjoy! Remembering Rod Taylor, who died on this date four years ago (Jan. 11, 1930-Jan. 7, 2015). Thanks to his rich array of movies and shows, he is still very much with us. It's as if he made time stand still. Let's head to the Caribbean to soak up some warmth and dive into blue waters. Grab your treasure map and head to the page for "The Treasure Seekers" to read the updated page and watch the movie. The movie had a troubled run through production and release. Its appearance on VHS surprised even its star, when a fan handed Rod Taylor a copy to autograph in the mid-1980s. Who loves ya, baby? 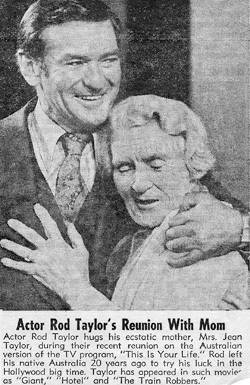 In 1981, Rod Taylor guest-starred in "Hellinger's Law," which would have been Telly Savalas' follow-up to "Kojak." The show wasn't picked up as a series, and "Hellinger's Law" has never had a home-video release. I've uploaded Rod's scenes from a VHS tape recorded from TV. See the "Hellinger's Law" page for more info and the video, which amounts to about 10 minutes from the 90-minute broadcast. Another new video treat: "Capital Gains," which was an installment of "Goodyear Theatre" in 1960. Here's a roundup of pages that had significant upgrades over the past few months, with additional information, galleries and video. Marbella: Information added and full movie uploaded (converted from VHS). Sunday in New York: New info and pictures in the gallery. 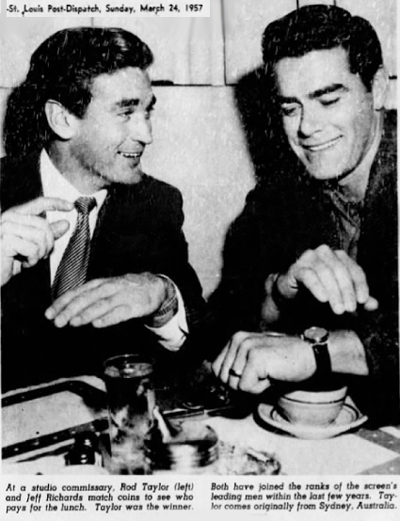 Utah Development Company ads: Among Rod Taylor's less popular works are a series of ads he filmed for the Utah Development Company in Australia. The ads aired on Australian TV in 1977 and also were included in an hour-long TV news investigation of the company on Australia's "Four Corners." I pieced together the video using the "Four Corners" footage and some some 35mm workprints (without audio) I acquired and had converted. Rock Star Rising: The audiobook that Rod narrated -- first titled "Hard Rock Lovers" and then "Rock Star Rising" -- is now available for free on YouTube, thanks to the book's author, Paul Kyriazi. Schlitz Playhouse/Lux Playhouse: Ready for a 60-year-old Rod Taylor rarity? In 1958, Rod Taylor starred with Rod Steiger in "A Thing to Fight For," an episode of the CBS antholgy series Schlitz Playhouse. It had been on my "most wanted" list for a long time, and I found it on 16mm film via eBay. A local company converted the film for me, and I am happy to share the bounty. Hell on Frisco Bay: Rod's first movie made in America had a beautiful DVD/Blu-Ray release. I've updated the page with more photos and background information. Playhouse 90: More photos and info on all five of Rod's Playhouse 90 appearances. Studio One in Hollywood: More background on this un-Rod-like role. Zane Grey Theater: More photos and info for "Picture of Sal." Jacqueline Bouvier Kennedy: More photos and info. 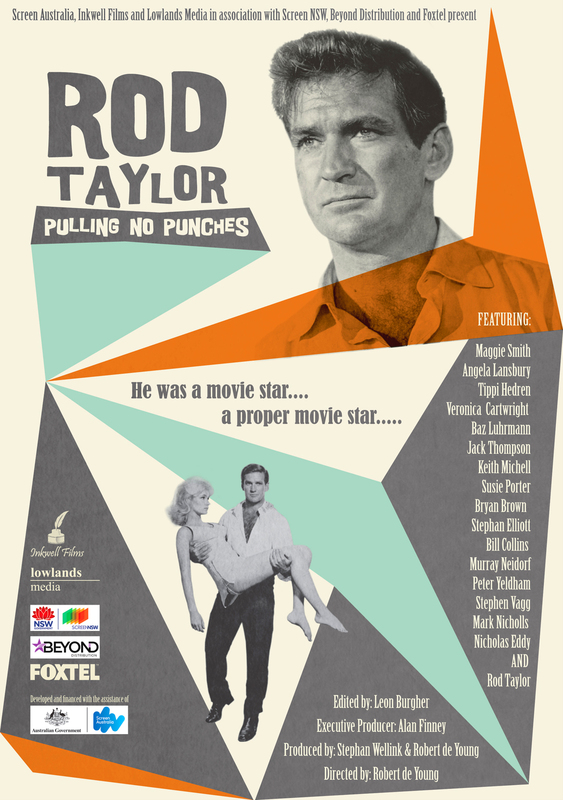 I put together a page for all the laurels for "Rod Taylor: Pulling No Punches." It provides a roundup of awards, film festival selections and reviews for the documentary. A frequent question to this site is "Why doesn't Rod Taylor have a star on the Hollywood Walk of Fame?" The short answer is "He didn't want one." The Walk of Fame is administered by the Hollywood Chamber of Commerce. It is designed as a tourist attraction, but it is indeed an honor to get a star. There is a rigorous nomination process and a significant fee. About 300 nominations are made each year, and only about 20-30 are selected. There is a five-year waiting period for a posthumous nomination. Anyone, including a fan, can nominate a celebrity as long as the celebrity or their management is in agreement with the nomination. This is probably the biggest answer to the "Why no star?" question: The celebrity didn't want it. That seems to be true in Rod's case. There also is a steep fee (granted, the celebrity can afford it, but if it were a fan-underwritten effort, it's pricey). When I first researched a Walk of Fame star in about 2002, the fee was $8,000. Three years ago, it was $30,000. Today, it is $40,000. The fee primarily pays for installation and the star ceremony. Finally, regarding Rod: A former castmate of Rod's inquired about getting him a star after he died in 2015. His widow, Carol, was touched at the suggestion but replied that Rod would not approve of a posthumous star for many reasons. As a birthday remembrance for Rod Taylor, I posted an album of photos of Rod as a youth in Australia. You can view it on Facebook. Watch Rod grow up! 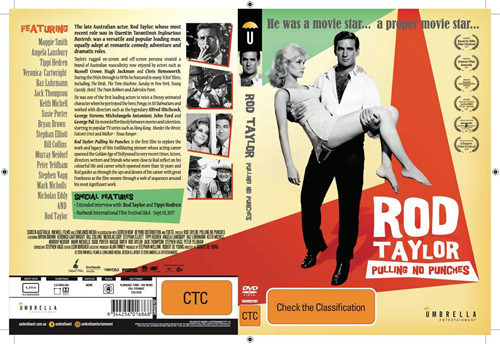 A DVD edition of "Rod Taylor: Pulling No Punches" was released in Australia on Jan. 3, 2018. Umbrella Entertainment released the PAL-format DVD and also offers it On Demand. The film is also available from iTunes in Australia and New Zealand. The filmmakers hope to report on releases in other regions in the near future. An extended interview with Rod Taylor and Tippi Hedren from 2012. A Q&A with Tippi Hedren and Veronica Cartwright conducted at the Burbank International Film Festival Sept. 20, 2017. How about a little sunbathing to kick off the summer? Many thanks to Howard Spellman for sending along these photos from 1957. 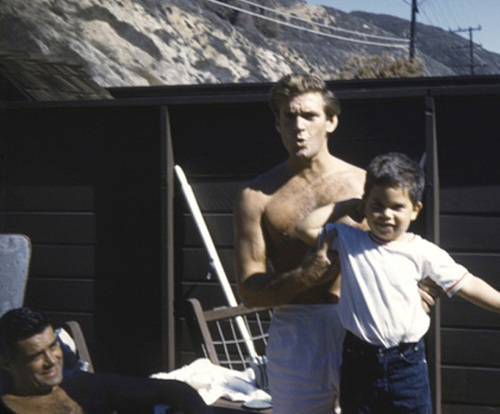 "My father remodeled Rod Taylor's beach house and brought me out there to show me what he does for a job," Howard wrote in an email. "I'm the little 5-year-old kid showing off my muscles, and this year I'm eligible for Social Security!" 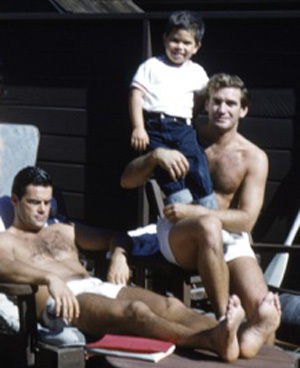 Also in the photo is actor Jeff Richards, who was separated from his wife and stayed with Rod in the Malibu house for a while. Coincidentally, Jeff's real name was Taylor -- Richard Taylor -- but it was changed when he signed with MGM in the late 1940s. 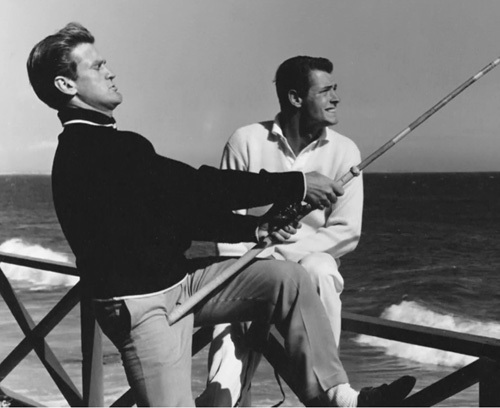 Here are a couple of other photos of the "Two Taylors": Rod and Jeff Richards in the MGM commissary and on a fishing pier. 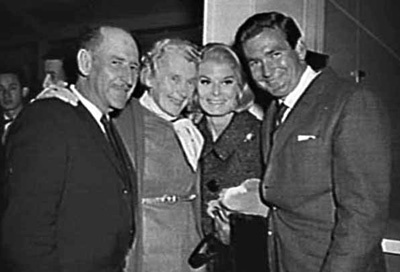 Actress Dina Merrill shared the screen with Rod Taylor in sparkling performances that spanned the decades. Merrill died May 22, 2017, at age 93. She was the daughter of Wall Street broker E. F. Hutton and cereal heiress Marjorie Merriweather Post. Despite this great fortune, she was very much a working actress, appearing in scores of movies and TV shows over more than a half a century. Check out this page for a roundup of her appearances with Rod Taylor spanning decades. In observation of Mother's Day, I scanned and assembled some treasures from my archives that feature Rod's mother, Mona Taylor. Born in 1902 in the region around Hull and Grimsby in Lincolnshire, England, Mona was a proper English lady. 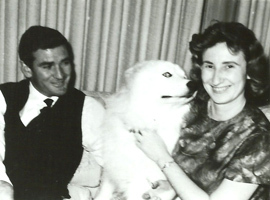 She immigrated to Australia and, in 1928, she married Bill Taylor, a knockabout Aussie bloke. Their personalities clashed, but they were married for 55 years. Bill died in 1983, and then Mona moved to California to live near Rod. She died in 1991. Mona Taylor (n�e Thompson and also known as Mona Stewart Taylor) was a writer of short stories, novels and poems. 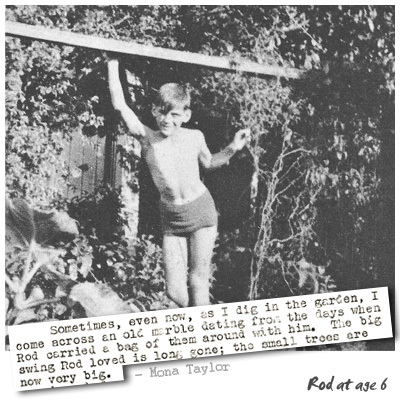 Here's one special item that she penned: "A Letter from Australia" (PDF) in the Rod-Lore fan newsletter of April 1965. Walk the red carpet with the filmmakers and friends at the Beverly Hills Film Festival! A photo album of activities surrounding the screening "Rod Taylor: Pulling No Punches" is available at my Facebook page. Feel free to Friend me while you're there! 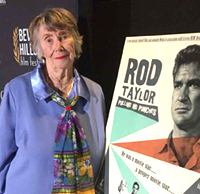 The Rod Taylor documentary "Pulling No Punches" was a winner at the Beverly Hills Film Festival! The film won the Audience Award for Best Documentary at the festival, which ran April 26-30, 2017. Want to hear an hour-long discussion about Rod Taylor's life and career from experts on the topic? Then have a listen to the second half of a recent broadcast of an Australian Radio show, Film Buff's Forecast, from Jan. 31, 2015. Start at the 56:00 mark for the segment, which features a conversation with Steven Vagg, the author of "Rod Taylor: An Aussie in Hollywood" and Mark Hartley, an Australian filmmaker and director who interviewed Rod for the "Pulling No Punches" documentary. I want to thank Stephen for telling the listeners about the "awesome" and "lovely" webmaster of this site at the end of the broadcast! I appreciate the sentiments and the shout-out. Today would have been Rod's 85th birthday. The world has been celebrating his life and career this week upon the news of his passing. Rod died at home on Wednesday, Jan. 7, 2015, surrounded by his family and friends. I want to thank all the fans who have left such lovely messages in the guestbook, and I encourage everyone to continue posting comments: Sign/read the guestbook. I also am posting obits and tributes to Rod from major media outlets. It is so heartening to see the outpouring of love and appreciation for his talents, versatility and all-around goodness. Draw a circle around Taylor's career from 1955-65, and you justifiably can rate that period with the heydays of any Australian actor, before or since. His work during this time spanned almost every genre: sci-fi ... horror ... animation ... drama ... breezy romantic comedies ... and biopics. Two months ago, I submitted his name to the Australian Academy of Cinema and Television Arts � which celebrates our country's greatest achievements in film and television � for its lifetime achievement award. Because Rod Taylor was rarely mentioned in Australia when we spoke of success stories. Because he was the son of a steelworker who forged his way to Hollywood. Because he started his career near the sprockets of a movie frame, then ended up front and center. The saddest of news to report: Rod Taylor has died. Liz Ploger, an assistant to Rod in the 1960s, wrote to me today that Rod fell down about two weeks ago and was hospitalized. He was able to return home, and he subsequently had a heart attack and died in his own bed. Rod died at home on Wednesday, Jan. 7, 2015, surrounded by his family and friends. His daughter, Felicia said in a statement: "My dad loved his work. Being an actor was his passion � calling it an honorable art and something he couldn�t live without." TCM has scheduled a five-film tribute to Rod Taylor on Jan. 29, starting at 8 p.m. U.S. Eastern Time. The featured films will be The Time Machine, The Birds, Sunday in New York, Young Cassidy and The Glass Bottom Boat. 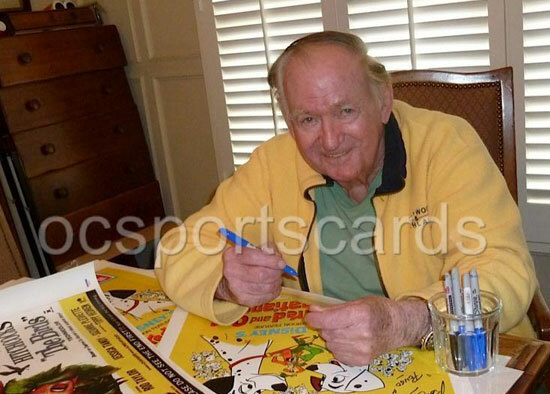 Rod Taylor participated in a rare autograph signing session on Jan. 31, 2014. The OC Dugout, also known as Orange County Sportscards, held a private autograph signing session with Rod, and the results are posted at the ocsportscard store on eBay. The items are pricey but beautiful! Below is one of the photos they took of Rod during his signing.